The tale centers on self-storage manager Marlena Montoya, who finds cartons of drugs in a unit that was supposed to be empty. It all goes downhill from there, as a county task force puts an undercover cop on the payroll, one of the owners gets personal, and the local detective stays for dinner. When two men are murdered and the victims are tied to the Jade Beach facility, it falls to Marlena to hunt for the truth with an assist from Monarch Beach detective John Kincaid. 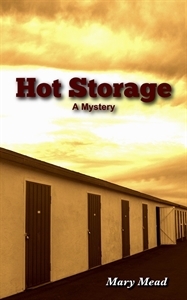 Though “Hot Storage” isn’t officially part of the Monarch Beach series and introduces new characters, Kincaid is included as a familiar figure for dedicated readers. There are three books in the Monarch Beach series, beginning with “Out of the Blue” and followed by “Wild Blue Yonder” and “Bluebonnets.” Mead is working on a fourth installment, “Deep Blue See,” which will bring back Tee, Tim and the group from the Gem. Also on tap is “Blue Blazes,” which will be another trip to Monarch Beach.